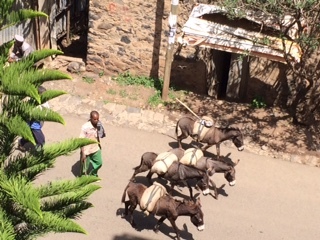 A beautiful Gonder morning has broken on our first full day in Ethiopia. The initial night spent on any international trip feels long, but in Gonder the night opens up in ways that assail all the western senses. Amharic prayers are called out in the darkness, as the scent of smoke curls in tendrils under every door frame, around the head, into the nose. Jet lag prompted my collapse into sleep at 8 p.m. and to then jolted me awake at 2 a.m. An entire novel later, I put on the now much-appreciated Ethiopian Air sleep mask and drifted in an out of seep until 9:30 local time. Today’s goal: Finalize the week’s goals. Our Communication short course starts Tuesday with the Basic Tools of Writing, What is Communication and Messaging Types. We continue Wednesday with looking at different Media Types, PR and Developing Communication Plans. Avoiding dogs that may carrier rabies. Seeking treatment if exposed to rabies. Although most people are familiar with rabies, animal vaccinations are not required like they are in the U.S. Dogs are not seen as part of the family as in the west, and vaccines are often not sought for them—even among veterinarians who own dogs. Those people exposed by a bite go to traditional healers, not doctors, and kids, especially boys, have a high risk of both exposure and death. But knowledge is a call to action accepted by a community are key to addressing any health issue, and we hope we can make a difference in both areas with our study. The chance to immerse in this community is a gift. There is purity in its spirit and energy in its people that I have never felt anywhere else. As our adventure begins, I believe and hope we are prepared to contribute to his amazing community and, hopefully, make a difference. Posted by Nicole Kraft at 5:18am July 20, 2015 Posted in Public Health and tagged Communication, Ethiopia, Ethiopian culture, Gondar, Ohio State University, Rabies, University of Gondar. Bookmark the permalink. ← 2015 Summer Institute: What happened to Saturday?